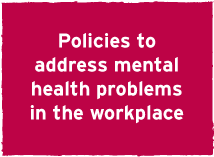 All our signed organisations commit to normalising the conversation about mental health in the workplace. We love to showcase great examples of how they have used the Employer Pledge and our seven key principles to provide ideas for what you can do in your workplace. 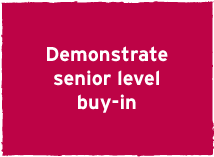 Buy-in from the senior leaders in an organisation is crucial to the success of an action plan. If they have their support, they will find it much easier to change the culture of your workplace. Even better, getting the senior leader to be open about their mental health at work can create a seismic shift in how mental health problems are talked about amongst employees. Accountability ensures that your action plan is successfully delivered. 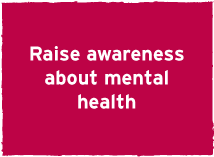 It's important to find the right team or person for this responsibility to sit with – this will ensure your organisation keeps the momentum going on changing attitudes to mental health. It’s also crucial to put in place ways to monitor your progress so you know what’s working. 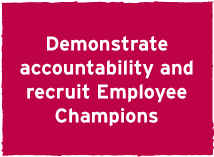 Recruiting Champions is a fantastic way to support your work and help you get the message out to all employees. To create an environment where conversations about mental health are commonplace, you need to make people aware of the issue. Many people have never thought about their mental health before so it’s important to make them aware of how important it is. Whether an employer has a standalone mental health policy or addresses mental health within existing policies, it is important that employees are informed about what they should do when encountering mental ill health. A clear mental health policy establishes a framework for everyone to work within and shows new recruits and current employees that the organisation takes their mental wellbeing seriously. The majority of employers tell us that getting their employees to share their personal experiences of mental health problems with one another is an incredibly powerful tool. We recommend this is done at an organisation-wide level but also encourage conversations at an individual level. 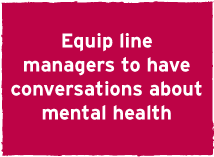 It’s critical that all of your line managers feel confident having a conversation about mental health with their line reports. Increasing their capability to spot signs and symptoms in their team, and feel confident in discussing this with those who are struggling will help stop problems before they become more challenging. 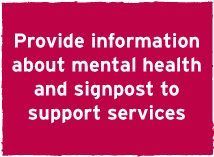 Once you’ve got your workforce opening up about mental health, it’s important to provide information about the subject and enable employees to easily access support services available to them when in need. Still interested in signing the Employer Pledge?